Our last stop before loading was to top up all tanks, including our 100-gallon reserve in the support trailer, with high-grade jet fuel. Jet fuel has no additives to clog filters in extreme cold.With very little pomp and flag-waving, we arrived at the Port of Tacoma, Washington, and shoe-horned The Turtle Expedition’s travel/research truck and its support trailer into a 40-foot dry container, basically a big metal box which opens with double doors at one end. The length was not a problem, but height and width were close. With tires deflated to 10 psi and all boxes and racks removed, it was still a tight fit in the 40-foot container. Top clearance going in was about 1/4 inch. We had to exit the cab through the camper. 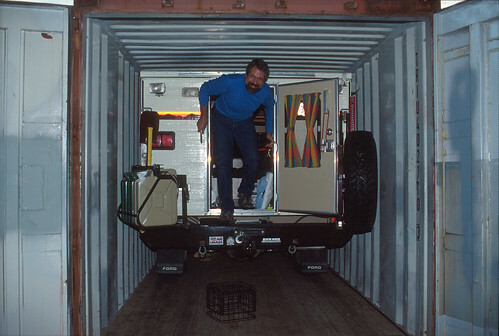 The trailer was relatively easy to load, using the front hitch to push it in. 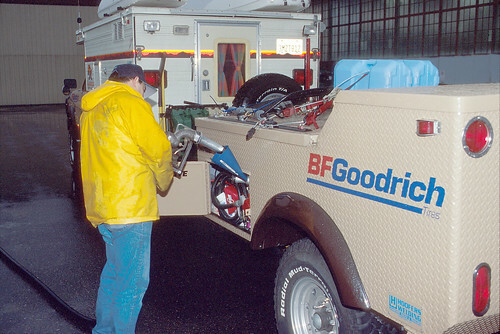 To insert the truck, it was necessary to remove the front vent on the camper’s roof, as well as the Yakima roof rack and the Packasport roof-top storage boxes. Then, with the tires aired down to about 10 psi, the mirrors folded in, and three people sitting on the back bumper, we inched through the container door opening with about three inches of clearanceon each side and perhaps 1/4inch on top!! Once inside, we gained two or three inches overall. 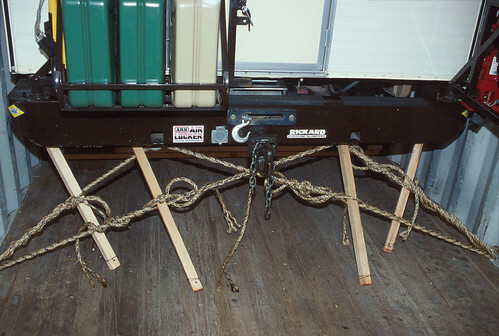 Wheels were blocked and suspension travel was limited using ropes and twist-sticks, a crude but seemingly effective method of tie-downs. We’ll know more when we open the container door in Magadan. Total cost of shipping to-date has been about $6,275.00, and overall, a relatively simple process. The Turtle IV’s suspension was sucked down using ropes and twist-sticks, a simple and cheap method of tie-downs which could be tossed in the trash when we arrived in Magadan. 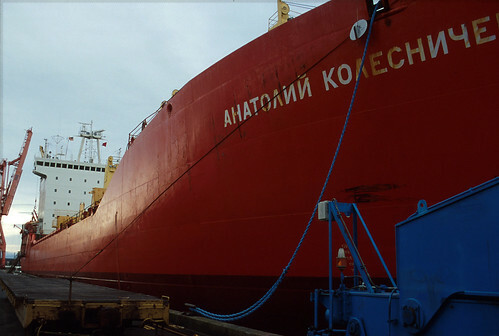 The FESCO ship, the Anatoliy K., sailed out of the Puget Sound on January 12. It would take almost a month to reach Magadan. The FESCO ship, the Anatoliy K., sailed out of the Puget Sound on January 12. We spent the next three weeks taking care of last minute business in Seattle, WA, and preparing for our own departure by Alaska Air to the Russian Far East. We have now been in the Northern Pacific port city of Magadan for eight days, and they have gone by very quickly. Much time has been spent running from government office to government office to have our visas registered, and to do as much preliminary customs paperwork as possible. Thus far, it appears that our entry onto Russian soil with truck and trailer will be surprisingly simple. Since we are “in transit” to Finland, only the major equipment such as cameras and computers needed to be documented. It appears that ours is the first foreign vehicle to ever request such a transit document from Magadan, which seems to be in our favor. The Anatoliy K. is already five days late, but we have been assured it will arrive tomorrow. The Sea of Okhotsk is free of ice, which is unusual for this time of year. There are some older more interesting buildings in Magadan, built by Japanese war prisoners, so we were told. For the most part, it is not an attractive city. Traffic was light around town. Fuel shortages, sub-zero weather and icy roads prompt many Russians to store their vehicles during the winter months. These Soviet style statues are quite interesting. However, it’s not all bad. There are some older more interesting buildings built by Japanese war prisoners, and in the evening, when traffic has all but vanished and the lights sparkle off a blanket of snow, there is a comfortable, quiet air of a mountain ski resort. The people in the street are dressed for the cold, with fur or leather coats and classic Russian fur hats. Fresh vegetables were nearly impossible to find, but eggs and fish, were available. 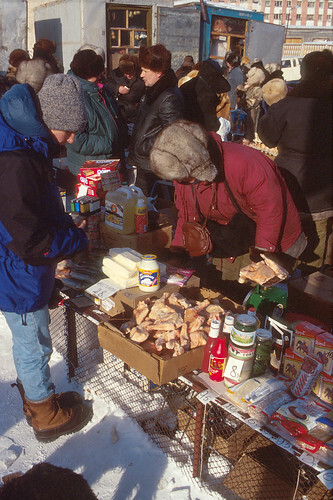 Hot-dogs and frozen chicken were popular items. At -20°F, everything stayed frozen. 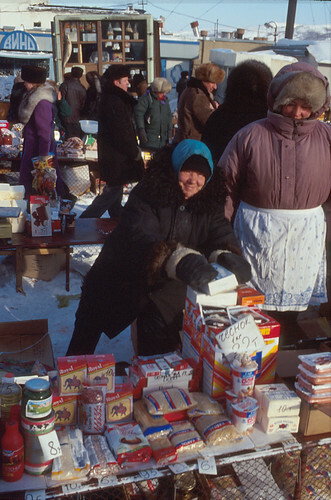 Russian women bundled up against the sub-zero temperatures to hawk their wares on the street. We wondered if we were seeing the start of the free market in these fledgling entrepreneurs. Pretty girls sell flowers out of glassed-in kiosks. 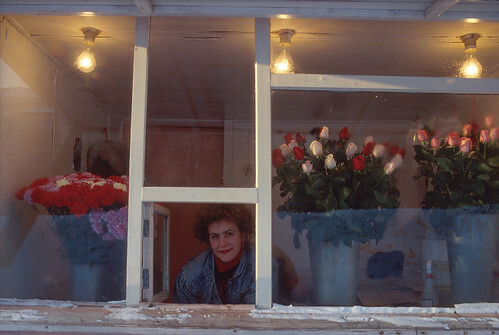 Russians love flowers, even in Winter. Pretty girls sell flowers out of glassed-in kiosks, and the open markets offer all sorts of interesting foods from the U.S. and Asia. More so than any Russian city we have been in, Magadaners smile and talk on the street. It’s a small-town atmosphere, and not as intimidating as we had imagined. 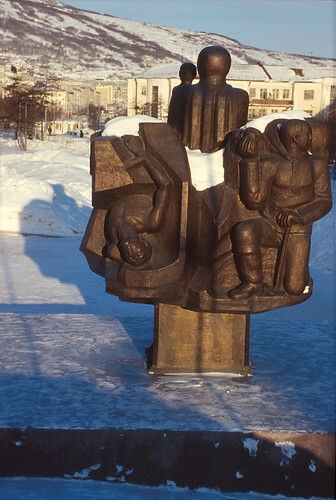 Visiting the Regional Museum and the Geological & Mineralogical Museum, we have been reminded of the evil beginnings of Magadan, originally founded as an administration and transfer/receiving point for the masses of political, social and criminal prisoners brought here to workin the rich Siberian gold and silver mines. The permafrost in the Kolyma Valley has produced some incredible examples of saber-tooth tigers, mammoths, and other prehistoric animals. 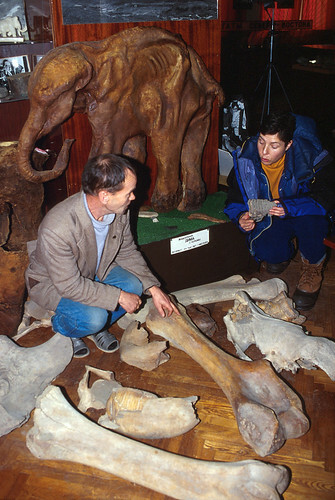 Dima, (background), a completely intact baby mammoth, was an interesting find. 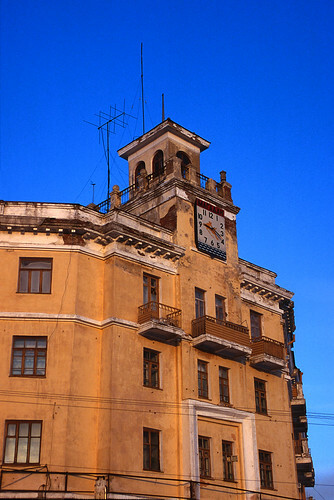 In 1931, under Stalin’s rule, an organization called Dalstroy was set up to oversee the development of mining in the area. Some historians estimate that as many as sixty million (60,000,000) people died in these brutal labor camps, and as many as twelve million perished just in the Kolyma Gold fields near Magadan, where conditions were so terrible, some of the camps did not officially exist. Only with Stalin’s death in 1953 was Dalstroy abolished, but its legacy of guard towers, barbed wire compounds and unmarked graves remains to haunt today’s citizens with a human atrocity which far surpasses even Hitler’s Holocaust. We also were amazed by some of the natural history. In addition to huge quantities of gold, silver and other minerals, the permafrost has produced some incredible examples of saber-tooth tigers, mammoths, and other prehistoric animals that roamed these valleys thousands of years ago. Dima, a completely intact baby mammoth, was an interesting find. The road heading west from Magadan to Susuman and Yakutsk on the Lena River is still shrouded in mystery. Some say it may be passable in the winter, but most have no idea. Even the current Lonely Planet Russian Guide, normally a reliable source, describes the road east of Magadan as a “—sometimes freight route” “—roughshod and impassable in Winter”. We have heard of one mining company which sends convoys west about once a week, weather permitting. We are researching other possibilities. The general consensus is that, if the road is passable at all, it would be foolish to attempt this route alone. Temperatures can drop unexpectedly to below -100°F (-73°C), and high winds can create complete whiteouts for hours, burying the road for days in the process. As prepared as we imagine we are for extreme cold weather, there is no sense in pushing our luck. If a lone vehicle slides off the road or is trapped in a storm and the engine dies for any reason, the occupants have little chance of survival. We are carrying special Northern Outfitters extreme cold weather gear for a worst-case scenario. This clothing can keep us warm down to –100°F.